It occurred to me the other day that for as much as this blog is about knitting, I don’t really blog about what I’m knitting very much. I will confess that it is due to an equal mixture of laziness and busyness. Because, to blog about what I’m knitting means taking pictures. There are so many wonderful knitting bloggers out there who are excellent and diligent about this, some of them taking pictures of such profound beauty that it makes you think they’re wasting their talent on knitting and should become professional photographers instead. Unfortunately, I don’t fall into this category. However, I decided to challenge myself and share a recent project known affectionately as the Pastel Candy Sock. I call it that because the yarn colors reminds me of pastel candies you get in the spring around Easter, especially the purple hued socks, and the garter chevron pattern sort of forms Ms. 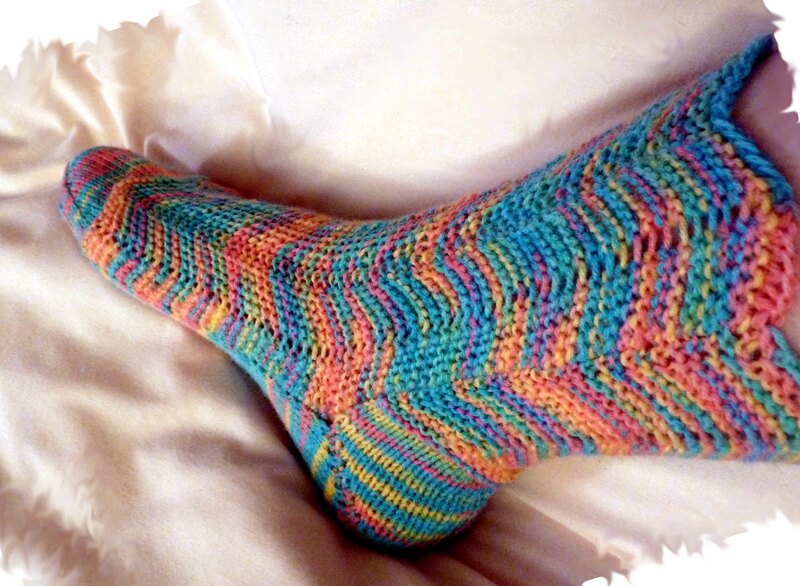 Pastel Candy Sock in the large size. Pastel Candy Sock in the small/medium size. No one near me has small feet so I couldn't have it modeled. 1) The undulation of the garter chevron makes it fab for variegated yarns, unfortunately this doesn’t eliminate color pooling if that is the sort of thing that bothers you. 2) No Kitchener stitch toes. 3) Easy two round repeat for this awesome result. 4) Boomerang heel – my new favorite! This will be a recurring theme in all my sock patterns henceforth. 5) Did I mention no Kitchener required? 6) Stitch pattern is super easy to memorize. 7) Features a rounded toe. 8 ) You don’t see many garter stitch socks out there. Unfortunately, I wrote the pattern for Bernat Sox yarn, which I later discovered was discontinued! Blarg! But, you can still find it on Amazon, so there’s always that option. Otherwise, the pattern can be knit to any sock that falls on the thicker side of things. I am still finishing the final sock (the fourth) and then I will be done with the pattern and will get it posted!